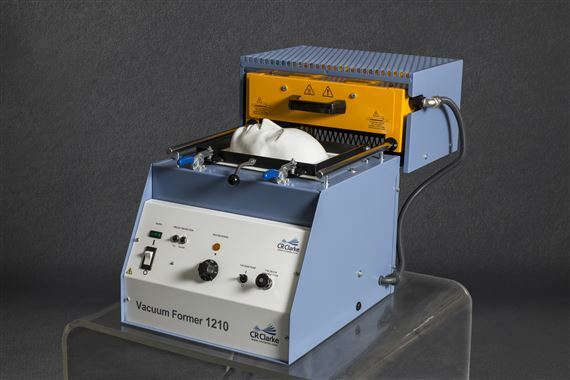 Our CR Clarke CR1210 Vacuum Former has been developed for high performance, ease of use and low maintenance. The machine is fitted with a robust diaphragm vacuum pump that generates -0.83 Bar, and also provides a blow release facility to aid removal of the completed forming. The ceramic heater system heats all thermoplastic materials quickly and evenly. Machines are fitted with our safety interlock system to prevent taller molds damaging the heater system, while the platen and the heater hood both run on chrome plated slides with nylon bushings for smooth operation. The material seal is custom manufactured from RTV silicone as a one-piece gasket, and the platen seal simply lifts out for easy replacement. A stand with shelf and lockable castors is available as an accessory for the CR Clarke CR1210.